Earlier this month, T-Mobile began targeting AT&T’s Internet of Things (IoT) and machine-to-machine (M2M) customers by offering them free 2H service through the end of 2016. Now T-Mo CFO Braxton Carter has elaborated on how the Un-carrier’s 2G plans differ from AT&T. “Until you get voice and data on LTE, you can’t refarm spectrum dedicated to legacy technology,” Carter said. He went on to say that 60 percent of T-Mobile’s spectrum is currently being used for LTE service and that another 35 percent will be refarmed for LTE. When it comes to the other 5 percent, that spectrum will continue to be used for 2G. “We are committed to keeping a very thin layer of legacy GSM out there for our M2M, and that’s a unique opportunity in targeting what’s happening at AT&T, where they’re shutting down all 2G and stranding a lot of 2G players,” Carter explained. AT&T has said that it will shut down its 2G network by the end of 2016. However, T-Mobile expects to keep its 2G service up and running through 2020 to give IoT and M2M customers plenty of time to transition to LTE. Carter explained that T-Mobile is a net payload decrease on the network with Binge On, even after signing partners to the program and seeing data increases. 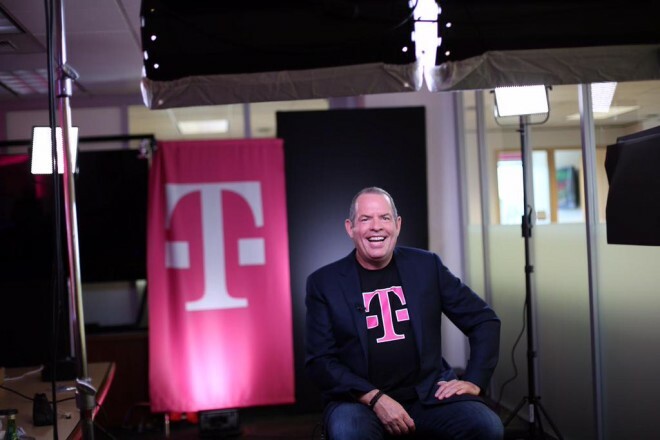 Video now makes up 70 percent of the data traffic on T-Mobile’s network, Carter said. TV (video) is 70% of data usage?!?!! What a waste. Business users just need data for email – some with attached docs. Also access to to some data bases (eg. Stocks, RE Sales sites, Maps, etc. If only business customers were the majority of t mobile it would be a waste, but when they don’t even account for 3% I mean…. also you can scratch maps out, being that with here maps you can access places and such offline without a data connection. Even if you minus business customer’s their are a bunch of phone that do not support LTE or VOLTE. So T Mobile at minimum needs to keep a thin GSM layer with Edge. T Mobile USA and their authorized retailers are still selling phones that do not support LTE and VOLTE. If T Mobile wants to shut down GSM and Edge around 2020 they need to stop selling the phone that do not have LTE or VOLTE unless they are prepared to give free replacement LTE/VOLTE phones out to people who trade in a non LTE/VOLTE handset. Business users rarely use their work phones just for business, unless there company cuts off their data plan. Where have you been? It’s all about the Youtube, Netflix, Hulu, etc. Business users need some QoS, but overall data use is rather low, which is why ATT and VZW can get away with gouging them (besides long term contracts and a general unwillingness on many bosses to try something new, e.g. “No gone got fired for buying AT&T/Cisco/IBM/etc”). That said, I’ve always been against streaming both because of DRM and the like (you no longer control your media) and because it’s such a gigantic waste of spectrum and bandwidth, as is most broadcasting in general–how many simultaneous airings of Big Bang Theory, Simpsons, Family Guy, etc do you need per hour? Ditto for the infomercials. If you could just copy it during the first airing and just air them for new people once a year, do you have any idea how much broadcast (especially satellite) bandwidth you could save? Likewise, streaming the same video to multiple people (assuming it’s not a live feed where it really can be broadcast or multicast on a single stream) is a gigantic waste, but it’s precisely why so much bandwidth is needed because Hollyweird wants to shackle their precious media down from your grubby little hands. Oh, and while I’m bitching, let me add a huge peeve: slide shows on video. The individual images take a few MB or so. The video is a few HUNDRED. What a waste! And you can’t even random-access it!! They are talking about Machine to Machine data connectivity not an employee using a wifi hotspot. Examples would be an ATM and or Vending Machine. I love T-Mobile but I don’t understand why they are going after someone who almost owned them. Stay in your lane. Keep going after sprint. Get better coverage overall in rural areas then go after the big two. Because there is a business opportunity. At&t and TMO were the only big players in M2m, AT&T is getting g out so TMo had an opportunity to get new customers. It really isn’t all that complicated, and TMo is also not going after anybody, just recovering business a competitor dumped and putting them on an existing program. “He went on to say that 60 percent of T-Mobile’s spectrum is currently being used for LTE service and that another 35 percent will be refarmed for LTE. Does this mean they’re finally planning on completely shutting down 3G/HSPA+!? That’d be great news. They’d better start going after retaining existing customers. I’ve stuck with them for $15 years…which is an eternity in mobile phone world. This week we moved my husband’s line to my account and changed plans to save a little money. He’s way overdue for a new phone, so we arranged for that over the phone. Customer Loyalty guy asked if we wanted to get it at the store or have it shipped. I said we’d pick it up at the store. Went by the next day, and right at the last minute, the guy tells me they are now charging a $20 “convenience fee” for doing anything for you at the store. In other words, T-Mobile wants to charge you $20 just to sell you a $250 phone. Sounds like you should switch to Verizon. That’ll show em! it’s just another anti-competitive industry under FCC and DOJ supervision, don’t expect an effing pot of gold out of it. stop trying to cause yourself more trouble by bending over to sales reps.
of cause tmobile is going to keep 2g because outside big cities that is all what they have – no 4g no lte. att can afford shutting down 2g cause they got LTE pretty much everywhere. So there is no worries here on the voice calls. only the very old devices using the very old data speed from GSM. he actually put more cost on the network maintenance and operating a whole GSM network for completely non profit Technology now even though he has the other UMTS and LTE. That’s why I think AT&T is way business smarter than them.